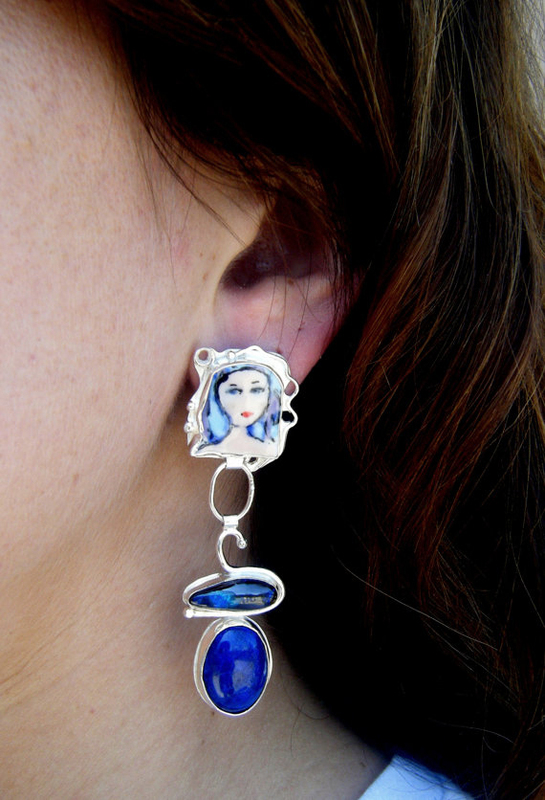 Laura Stamper, a designer from New Hope, Minnesota’s uniquely eclectic and bohemian pieces are an eye catching and bold forging of her background in in portrait painting and sculpture. 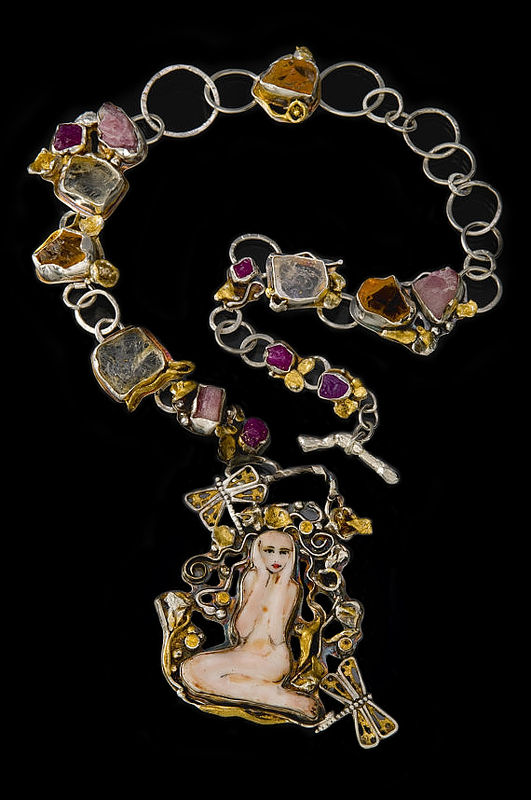 For the past 20 years, Laura has created wearable sculpture using primitive casting techniques, precious metals and gems, recycled silver and a very Art Nouveau brush over her work. Her process is highly involved, starting out by crafting porcelain sculptures and then firing the pieces at various temperatures. She does so layering the glazes to provide depth and a translucent appearance. The pieces are then set in sterling and fine silver and high karat gold with the use of raw precious and semiprecious stones. 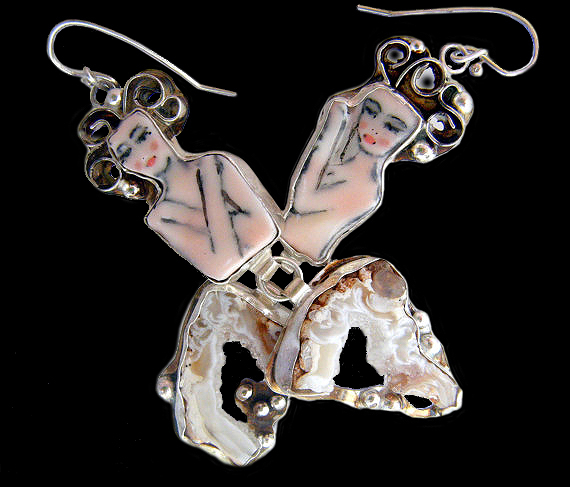 Her Goddess pieces are fantastic and intrinsically feminine in an artistic, compassionate way. What consistently catches my attention with Laura’s work is the kinetic energy and somehow unmoving fluidity of her pieces. They in essence seem alive – these are the pieces that are timeless, that capture your attention, your wistfulness forever. These are true ‘energy’ pieces. All images courtesy of Laura Stamper Design. I love the explanation of the process. Adding layers of glazing to add depth is always a cool and effective effect. What really wraps up the design for me is the silver used to clean and modernize the look. The silver is really elegant touch, that makes her pieces, boho somehow! From what your explaining here, it sounds like Laura is taking the concept of mix media work out the stratosphere. Casting, Porcelain work, Stone and Gem work, Painting and then comprising a way to turn them into a wearable piece of jewelry. Mannnnnnnnn i hope folks dont sleep on this. I AGREE! Her work is highly unique and a stylized and effective combination of varying materials and design approaches!